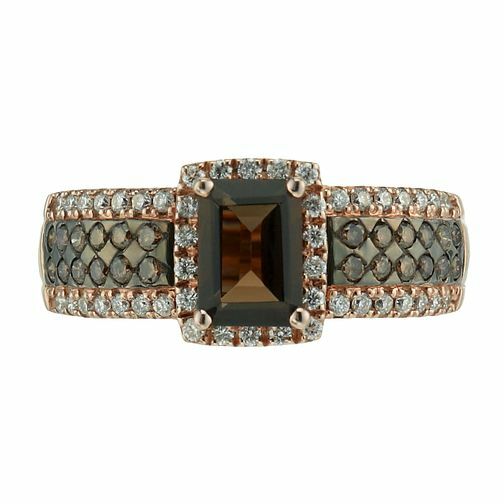 With a sumptuous 14ct Strawberry Gold band embellished with a half carat of glistening, claw set Vanilla and Chocolate Diamonds, the Chocolate quartz centrepiece framed with glistening Vanilla Diamonds offers signature Le Vian indulgence. Matching band: 1056042. Le Vian 14ct Strawberry Gold 0.50ct diamond & quartz ring is rated 4.6 out of 5 by 19. Rated 1 out of 5 by Anonymous from Faulty claw that repeatedly breaks I have had this ring since 2013, and whilst it looks nice I can not wear it. I only wear it for special occasions for a couple of hours, and every time a claw breaks on it. I have had to take it back for a fourth time recently, and now Ernest jones have decided to charge me! Even though the ring is faulty! One of the times I took it back, they even replaced it and that one even broke. From looking at the ring you can see it’s hardly been worn, yet I am being blamed for the fault!? What is the point of buying a ring you can not wear? Rated 5 out of 5 by Anonymous from Absolutely stunning ring This is such a beautiful ring, and like previous comments , the photos on the website don't do it any justice. I can't stop looking at it and have had many compliments.